I am currently a Master's student at FIS. I found it delightful to learn that you have a blog :) I am taking the FIS1311 Technology course and our first assignment (in this class) is to create a blog and maintain a "professional" librarian blog. My blog contains mostly things that I've read relating to leisure reading, "librarianship" or other library related stuff. If you have any helpful tips about being a librarian, librarianship, or what to expect in the "real world" or anything, I am happy to hear from you. For the moment, my blog contains readings that I've come across, books that I enjoy, library related stuff. I hope to hear from you soon, when you have the chance to do so. If you also have any advice to us "future librarians" what would they be? How did you get into the field? How did you become a science librarian. I have yet to read all of your entries. Hi Faye, I'm really glad to hear from you. Welcome to the profession. I checked out your blog and it's a really good start. I hope you decide to continue after your course and beyond graduation. I went to McGill and graduated in 2000. 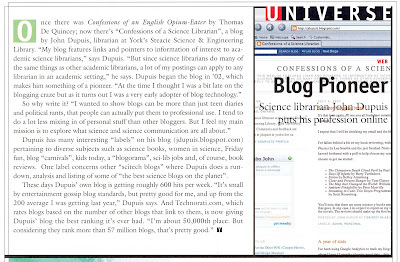 The whole story is here: http://jdupuis.blogspot.com/2006/02/confessions-of-science-librarian.html. Advice for future generations? I think it's really important to decide what you want to do and try and get some concrete experience in that, even just a practicum placement or volunteer work. Even a little experience goes a long way when applying for jobs. For science librarians, it really helps to have some sort of scitech background as that really helps build your credibility with faculty and students (or scientists/engineers in an industrial setting).